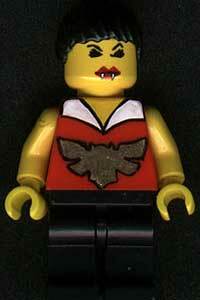 We might as well start off with a bang and have one of the silliest Vampirella Ephemera of the lot, a Vampirella Lego figure. Obviously these are standard Lego figures which have been "tampered with", but what the heck! And they sold on eBay! And I'm not too proud to admit that I actually bid on the lower of the two figures, but was sniped at the last moment! Oh well, what's for you won't go by you. 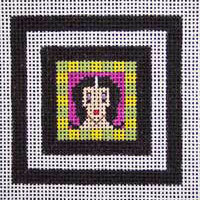 The eBay details are as follows "This brand new hand painted needlepoint canvas features Vampirella, Dracula's female vampire counterpart. She has long black hair with white streaks in the middle, dark eyes with purple eye shadow and blood red lips. This is a small canvas designed to be an ornament or a scissor fob, but it could also make up into a nice boxed stand up or even a small candy bag. The canvas is 18 count Zweigart mono and the design measures 2.5" x 2.5"." Yet another odd item on eBay. A wooden box with a felt lining. The auction details gave on indication of size, but if you click on the picture on the right you will get a better view of the box both open and closed. WOOD BOX WITH ORIGINAL ART COVER. Stain, Pen & Ink. Comes with felt lining (lower section). Artist: J.Wryghtlan. I have a couple of problems with this item ... 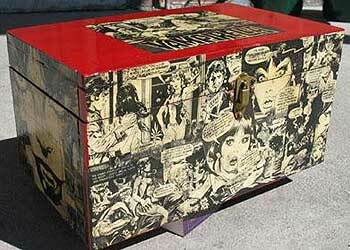 I think it looks quite good, but it makes me cringe to think that a copy (or two) of Warren Vampirella magazines were cut up to make it! 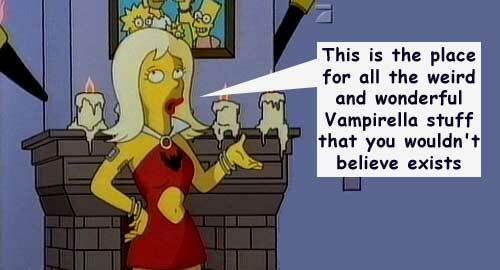 Though it is an interesting concept, the demise of a Vampirella magazine is causing me cognitive dissonance. I never got into Magic: the Gathering, though I know a few people who are very into that type of role playing genre. All I know is that it is a kind of duel between players involving strategy and a random element provided by the randomly dealt cards. A couple of enterprising Magic fans have created some custom cards which may not be tournament legal, but are certainly interesting! I have the set of five cards below, and I have to admit that they have all been very well made (click the picture to see all five full size).